I just want to start out by stating that I have officially broke my “no dining-out anymore” rule. It lasted a mere 3 days, and reflecting back, it was a stupid restriction to put on myself. I definitely lack self control when it comes to food. The short “no dining-out” streak was broken with an excellent meal with Omnivore’s Ottawa Supper Club. This month, it was held at Navarra, a Spanish influenced restaurant serving Basque-style cuisine. The restaurant is owned by talented Chef Rene Rodriguez, an entrepreneur who's cooking style is influenced by both his worldly travels and experience at other well known upscale Ottawa restaurants. 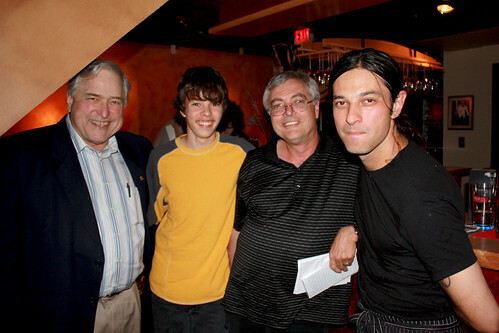 I was seated at a table with five other foodies who were not only well rounded eaters, but well travelled people as well. We had a great evening discussing everything from food to travel, and everything in between. A 5-course tasting menu was presented with wine pairings. I am no wine connoisseur, so I will refrain from commenting about the wine pairings. My only observation was that all the drinks were thoughtfully and carefully chosen. 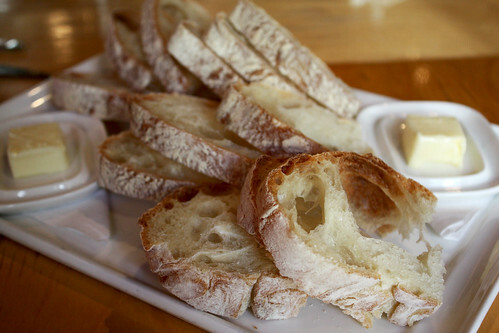 The meal started with fresh Italian bread, and tuna rillette made with ricotta cheese. The rillette was topped with fresh chives and piquillo peppers. The piquillo pepper is a spicy, yet sweet chili pepper that is traditionally grown in Northern Spain. 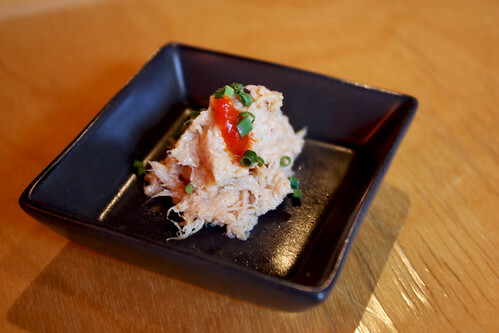 It added a nice spicy kick to the tuna rillette. The first course was a salad of local grape tomatoes. The tomatoes, along with bread pieces were immersed in a sweet vinaigrette seasoned with lavender, vanilla oil, honey, and sea salt. 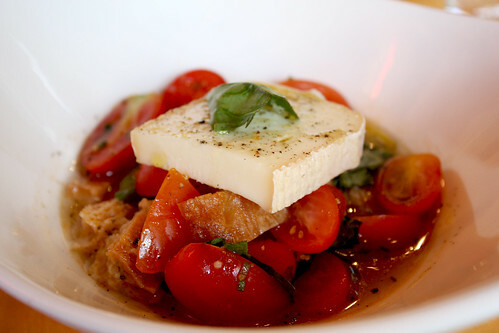 The salad was topped with soft taleggio cheese, and fresh basil leaves. The lavender and vanilla oil added a sweet and unique touch to the dish. 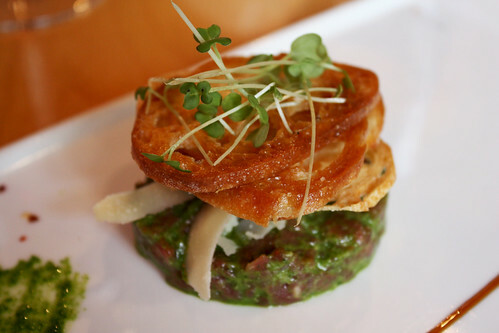 The second course was hand chopped beef tartare served with rocket pesto, aioli, and crostinis. I liked that the pesto and aioli did not overpower the beef tartare. This dish was highlighted with espelette peppers, a chili pepper that is very prominent in Basque cuisine. Smeared on the side was a lovely sweet Sherry paint. The next course was not for the faint hearted. 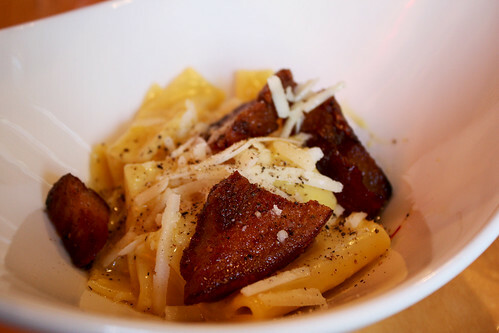 It was a pasta alla carbonara dish with crispy pig cheek, paccheri pasta, free-range egg yolk emulsion, pecorino romano cheese, and cracked pepper. This rich dish was finished with an aromatic truffle infused oil. Although similar in taste, pig cheek is not to be mistaken for bacon. Bacon is strictly from the rib region of the pig. Course number four was Spanish manchengo cheese. This was paired with an awesome coriander honey lacquered Serrano ham that tasted like a sweet crispy jerky. This dish was my favorite because of the perfectly seasoned Serrano ham. On the side were sweet apple butter, Sherry paint, and quince. Dessert was a delectable white chocolate soup. I want to preface this by saying that I am not normally a fan of white chocolate: too creamy & sweet for my likings. However, this warm dessert was to die for. The sweetness was balanced with salt, sour, and spicy tastes. 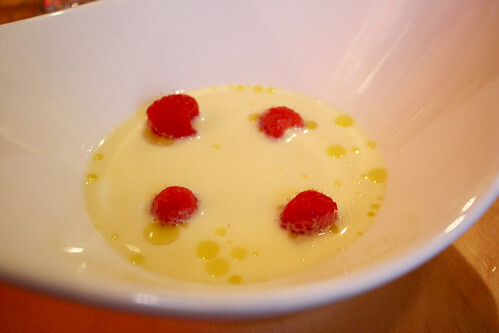 Mixed in with the white chocolate soup were candied ginger (spicy), vanilla oil, raspberries (relatively sour), and capers marinated in ice wine (salty). I loved it! I highly recommend this restaurant. The food is innovative, yet traditional at the same time. It takes you on an exotic journey without having to go anywhere. Check out last month's supper club event at Atelier at this link. The food looks so good! I'm a sucker for good beef tartare. I'll have to check this place out. Oh, that looks terrific! I have to try Navarra now. 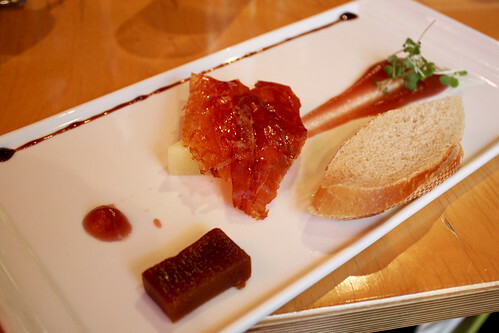 The quince paste looks like dulce de membrillo. The only source I know of in Ottawa is La Tiendita at Merivale/Carling. Their beef tartare is really good. You should definitely check the place out. I'll have to check La Tiendita out. Thanks for the heads up.